After completing my week-long bicycle tour from Helsinki to Kajaani, Finland with my friend Rob, I needed a break. I had been traveling for more than two-and-a-half months at this point, with very few rest days in between all my cycling. So with a few days to kill in Kajaani before the start of my self-guided bicycle tour with Upitrek, I decided I was going to just hang around town for a few days, get some computer work done at the library, and camp in the nearby forests. After Rob left Kajaani and took the train back to Helsinki, I spent the entire following day by the river – just outside the city center. I sat under a tree and worked on my computer. It rained for a little while and there were some pesky mosquitoes, but I did my best, working under the shade of a large pine tree. In the evening I returned to the center of Kajaani and purchased some sweet-potato french fries from the restaurant that Rob and I had dined at the night before. This place had the best sweet-potato fries I have ever had in my entire life! After eating, I wandered over to the library – just to check it out and see if it would be a good place to spend the following day, doing some more computer work. After I found the library and noted the posted opening hours, I laid my bicycle down on the grass just outside the building and began making some adjustments to my bicycle. For the previous several days there had been a loud clicking sound coming from my bicycle’s bottom bracket area and it was driving me insane. So I tried my best to fix the problem with the limited tools I had on-hand, but I wasn’t getting very far. In desperation I began to bang on the side of my bicycle with the palm of my hand, and that’s when, just at that moment, I was approached by two young people out walking their dog. “Do you need help?” the young couple asked. I tried to tell them that I was okay, but the truth was, I did need some help. I couldn’t resist the opportunity for assistance, so I said “yes” and followed the young couple to their home, which was indeed, just a short distance away. Their names were Perttu and Inka. They were a little under 30 years of age and just three months prior had purchased their very first home together. On their property was not only a small wooden home, but a guest house with a sauna and a work-shed/carport as well. Perttu took me into his shed almost immediately and we began working on my bicycle. After several months of bike travel, there was a lot that needed adjusting, cleaning, and looking after. Perttu took my bottom bracket apart and after some investigation made the determination that I probably needed a new bottom bracket. I agreed. But it was already pretty late in the day and the town’s only bike shop was already closed for the night, so Inka and Perttu offered to put me up for the night in their small guesthouse. I couldn’t have been more pleased! They gave me a shower, let me sleep in their warm (mosquito-free) guesthouse, and in the morning Perttu took me on a bike tour of the town before escorting me to the local bike shop so I could purchase the new part that I needed. After buying a new bottom bracket for my bicycle, Perttu and I returned to his home and we fit the new part on my bicycle. But to both of our surprise, the clicking noise that had been haunting me for the last several days was still there. The clicking wasn’t coming from my bicycle’s bottom-bracket as we had both assumed. It was coming from one of my pedals! After switching out my pedals with a pair of old ones Perttu had laying around, the clicking noise instantly went away. The pedals had been making that horrible noise all along. When I told Inka and Perttu that I was going to be participating in a self-guided bicycle tour with a company called Upitrek in two day’s time, they suggested I stay with them for another two nights. Reluctant, but thankful, I said yes. Above is Perttu (on the left), Armi (the dog – in the center), and Inka (on the right). Below is the small guesthouse that Perttu and Inka let me stay in while I was with them in Kajaani. During my last day in Kajaani with Inka and Perttu, I went on a short walk with the couple and was given a tour around town by Perttu and his aunt. We went to a small bakery where they made traditional Finnish bread made with the tar that comes naturally out of trees. The owner of the bakery even gave me a loaf of the bread for free, but I didn’t like it very much. As a vegetarian, I thought it tasted a bit too much like meat. That night Inka and Petru hosted a small, but wonderful dinner party on their patio. We ate stir-fry-style vegetables, potatoes, bread, and a whole lot more. Perttu cooked up some German-style sausages for himself and his other guests. I spent a lot of time that night speaking with Inka’s friend, Johanna, who had been to the United States on several different occasions. The dinner party didn’t end until after one in the morning. The long summer sun in Finland means that the sun doesn’t set until just before midnight, so we were able to continue the party until late into the evening without even realizing that it was so late. The next morning, I woke up early, packed up my things and said goodbye to Inka and Peru – thinking that I might not ever see them again. But as you will see in just a moment, that isn’t how things worked out. I met Urpo, the owner of Upitrek tours at the market in the center of Kajaani and then I followed him on his bicycle for about 10 kilometers back to his family home on the outskirts of the city. Once there, I was introduced to his wife and kids and given the details for the self-guided bicycle tour that I was about the undertake. After the maps, details and paperwork had been sorted, Urpo rode with me for another hour or so before eventually saying goodbye and wishing me good-luck on the rest of my ride. It was difficult for me to be back on my own again. I had enjoyed cycling with Rob during our bike tour from Helsinki to Kajaani and I felt like I had made friends with Inka, Perttu and their friends Annu and Johanna. Then I had met Urpo and his family. And then suddenly, I was all alone again… and I knew that I was going to be all alone for quite a while. Needless to say, getting back into the rhythm of bike touring on my own took some time. I was slow and lethargic at first. I didn’t really want to be riding anymore. I wanted a break. My body and my mind were tired. But I had committed to doing this bike tour with Upitrek, so I needed to press on. And after several hours of cycling, I began to get back into the groove. Then, once I made it to the city of Vuokatti, Finland, my excitement for bike travel returned! Suddenly I was in a lovely little ski resort town. Even though it was summertime, there were people running around town on cross-country roller skis and practicing their jumps on the massive downhill ski jumping hill. There were several lakes in the area, mountain bike trails and a couple different disc golf courses. This was my kind of town! I was so happy to be here… and I didn’t want to leave! The first thing I did in Vuokatti was climb up to the top of the ski resort and take some photos of the surrounding area. This was my first time in Finland where I was able to actually look down at the landscape and see the forests from above. It was really beautiful. After eating lunch at the top of the mountain, I checked into my hotel, which was situated on the edge of the lake you see in the photo behind me in the photo above. This was my favorite accommodation I had stayed in for months. The place was a cabin-like duplex with all the modern conveniences. It had a full kitchen, TV, a wonderful back patio, and even a sauna. I was only there for one night, but I could have easily stayed for an entire month or more if I had been allowed. The next day I cycled more than 70 kilometers from Vuokatti to nearby Sotkamo and then on to the tiny town of Kuhmo, Finland. There was very little in between these three small cities. Just a bunch of forests, lakes and swamps… but the roads were great for cycling. I stopped in a small village and ate lunch on the edge of a lake, just outside a remote forest cemetery. Then I cycled through the city of Kuhmo and checked in to a large, modern hotel situated on the edge of Lake Lammasjärvi. This hotel was also very nice and was located in a wonderful spot – near the city center, but even closer to wild nature. After being served a delicious 3-course meal in the hotel’s on-site restaurant, I took a long walk around the nearby lake – wandering out onto a narrow strip of land that jets out into the center of the Lammasjärvi Lake. The next morning I woke up early, ate breakfast in the hotel, and then cycled a short distance north to the tiny town of Lentiira. In Lentiira I was met by a stout little woman who took me out into the forest and together we waited in a bear hide for several long hours, in hopes of seeing a bear or other natural wildlife. We didn’t see any bears, but I did see a wolverine, and I got it on video too! (Click here to watch the video). Now that my bike tour with Upitrek was complete, I had to decide what I was going to do with myself for the next 10 days. In that amount of time I could easily have cycled the 800 or so kilometers back to Helsinki in time for my flight out of the country on the 10th of August… or I could simply hang around in the central Finland area, rest and get some much-needed computer work accomplished. I would then have to pay the extra $115 USD to take the train back to Helsinki. After days of wrestling it over, I decided not to cycle back to Helsinki (I had done enough cycling, I decided), but to hang out and enjoy central Finland while sleeping in the forest, showering in the nearby lakes, and working from the libraries I found along the way. After making this important decision, my first task was to cycle back to the city of Kuhmo from my current location in Lentiira. Luckily, this was just a short two-hour bike ride. Once in Kuhmo, I found the city library and then made camp in the woods about 5 kilometers north of town. For the next four days I lived in the woods and cycled into the city center to work from the library during the day, buy groceries from the local supermarket in the evening, and then either do some more work or watch videos in my tent at night. It was a nice way to live! On the weekend, the library was closed, so I used the time to break camp in Kuhmo and cycle the long 70+ kilometers back to the city of Sotkamo, which I had passed through briefly days before on my self-guided bicycle tour with Upitrek. Once I arrived in Sotkamo, I spent several hours cycling around the city in an attempt to find a place to set up camp for the next several nights. I eventually settled on a fairly exposed forest campsite, just a few meters from the road. Even though passing vehicles could spot my campsite if they were really paying attention, I doubted very few people would be able to see my green tent through the forest of trees and underbrush. Most people just aren’t that aware of their surroundings. The photos below show my idyllic campsite in the woods just north of Sotkamo, Finland. When I cycled into the city each day to work from the local library, I would leave my small Voltaic Fuse 6 Watt solar panel out in the sun in an attempt to charge up one of the two spare batteries I am carrying with me. The other battery I would take with me to the library and charge up via an available electrical outlet. For the last two months I’ve been carrying a copy of my massive 412-page book, The Bicycle Touring Blueprint, in my panniers. The book is big and heavy, so when I arrived in Sotkamo, I decided to finally leave the book behind. I donated it to the local library in hopes of inspiring a local teen, perhaps, of trying a short or long-distance bike tour for him or herself. 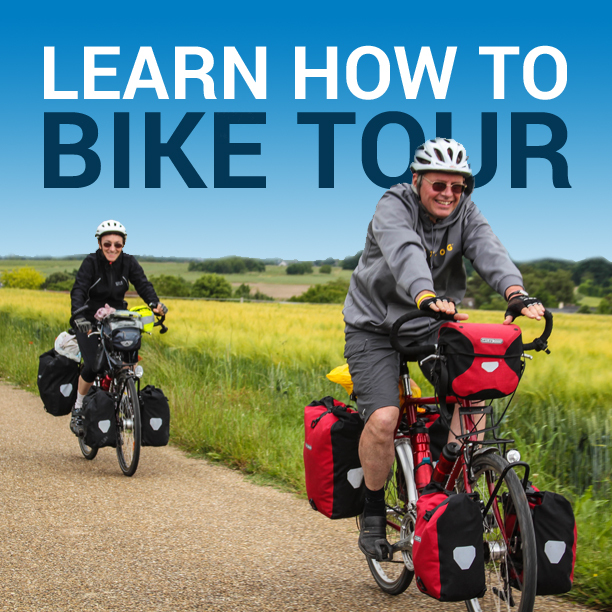 If you are interested in learning how to conduct your very own bicycle touring adventures, be sure to pick up a copy of The Bicycle Touring Blueprint for yourself. It’s available now at www.bicycletouringbook.com. 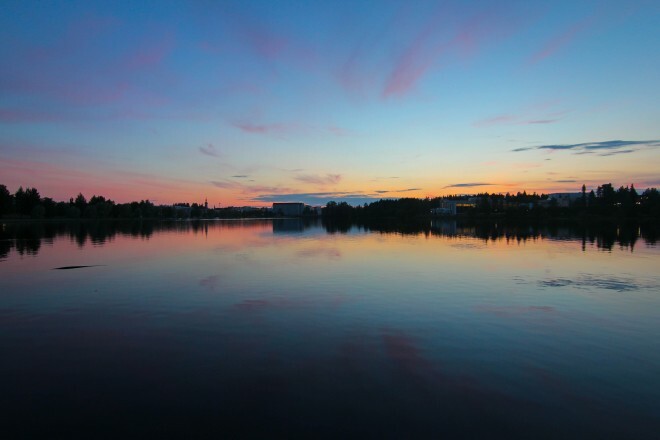 While working in Sotkamo, I would cycle into the city center in the morning, work all day long at the library, get some food at the supermarket after the library closed, and then cycle north of the city to a nearby lake, where I would then jump into the water and bathe. After drenching both my body and my clothes in the water, I would sit on the pier and dry out as best I could before cycling back to my tent in the forest. It was a great way to pass my time in central Finland… and I could have easily kept up this routine for several weeks on end. The time eventually came, however, for me to make my way back to Kajaani. Because I decided not to cycle back to Helsinki, I needed to return to Kajaani so I could take the train from there back to Finland’s capital city. Before returning to Kajaani, however, I sent a message to Perttu and Inka, letting them know that I would be returning to their lovely little town. As gracious hosts and incredibly kind people, they invited me to stay with them for two more nights before I jumped on the train and made my way south to Helsinki. So, as the sun set on the 6th of August, I cycled into the center of Kajaani and made my way to Perttu and Inka’s home. The following day I worked on my computer while Perttu and Inka were at work, and then in the evening, Inka prepared a delicious meal, which we ate together out on the couple’s patio. After dinner, Perttu introduced me to a Finnish throwing game called Molkky, where you throw a heavy, wooden dowel at twelve wooden markers, trying to be the first person to score an even 50 points. I won the game… but I have a feeling Inka and Pertu were letting me win. haha! I went to bed early that night and woke up at 5 am the next morning in preparation for the morning train back to Helsinki. After packing up my bicycle with all of my earthly possessions, I cycled a short distance across the Kajaani city center and boarded the capital-bound train. About 6 hours later I was back in Helsinki! Back in Helsinki, I had made arrangements to stay with a friend of a Bicycle Touring Pro reader named Silja. Silja and her significant other gave me a key to their home and let me come and go as I please, while I ran about the city trying to find a bike box, mailing tape, and everything else I would need for my flight to Dublin, Ireland on the 10th of August. I was able to find a bike box at a local bike shop during my first night back in Helsinki, and I was able to secure both an additional cardboard bike box and a roll of mailing tape on the following day. After two nights of rest at Silja’s house, I walked my bicycle and my two large cardboard boxes to a nearby bus station, packed up my bicycle and all my belongings inside the two cardboard boxes I had collected, and then took a bus to the airport. A few hours later I was in the air and on my way to Dublin, Ireland. The first three months of my European bicycle tour were over… and the second major leg of my bike tour (through Ireland, the Isle of Man and the United Kingdom) was about to begin! This entry was posted in Bicycle Touring Pro Articles, Darren Alff's Bike Tour Blog, Europe, Finland, Locations, Photos and tagged bicycle touring in finland, bike tour in finland, camping in finland, central finland, central finland travel blog, darren alff in finland, finland, finland bike tours, kajaani finland, kuhmo finland, small cities worth seeing in finland, sotkamo finland, what to do in finland, wild camping in finland.